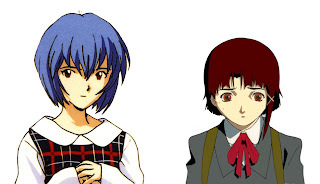 Image of Rei via Minitokyo, and Lain via Cels For Sale. Since this seemed to come up time and again in my reading, I was at last determined to make up my own mind about the issue. And this is the moment where I have to admit to what some anime fans might consider a cardinal sin: I had never seen Neon Genesis Evangelion. Not until a week ago. My not having watched it was not the result of some lack of desire. It was nothing more than circumstance. It was never really accessible to me until recently. That's because Evangelion now comes in the Platinum Thinpack, which is much more affordable than the series used to be. Having re-watched Lain to refresh my memory of it, and how, I was ready to venture down a new path. Well, actually an old path, but one which inadvertently seems to overshadow my beloved Lain. 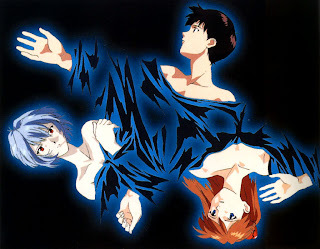 Still, I was prepared to keep an open mind and enjoy Evangelion as much as possible. I had enjoyed other works by Gainax before, and it's not exactly like Eva's list of recommendations is short. Image via NGE fansite (link). I managed to do about one DVD per night, usually after I would get off of work. 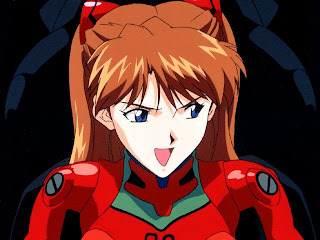 Things moved along fairly normally until the introduction of Asuka, because every anime needs an obnoxiously spoiled brat I guess. I didn't like her character from the get-go, and still don't by the end of it. But I digress. Admittedly she makes for more interesting group dynamics, and creates conflict in an initially placid plot line. It's just that her actions make it hard for me to feel any sympathy towards her even when her suffering becomes clear. After they toss Asuka into the mix, things do pick up. Tensions rise steadily and seem to climax heavily in the second half of the series. It's been a long time for me since an anime hit me as hard as the episode I'm about to tell you about next. I felt something bad was coming. The eighteenth episode, Ambivalence, is one of the most gut-wrenching pieces of anime I have ever seen. Certainly the most powerful episode in the Eva series. I was literally on the edge of my seat at the end of it, hardly believing what I was seeing. Part of that is probably due to the overall unexpected nature of the turn of events. After this, the rest of the episodes maintain a lot of the uneasy momentum gathered in Ambivalence, even if they do not quite manage to equal or exceed it. Eva's final episode is a bit of a controversy. It's unusual execution, unconventional presentation, and unexpected structure make some people love it, and a lot of others hate it. This is where Eva and Lain have the most in common, with imagery that questions the nature of reality itself, offered in a less than coherent manner. Fragmented visuals and dialogue only serve to enhance the confusion, and the viewer is left with virtually all important questions of the series unresolved. This is as far as I have gotten, and now I am in the process of acquiring the next to DVDs which contain some supposed closure to the whole ordeal. Took me some reading to figure out exactly what I'm supposed to be looking for, what with all the revisions and remakes of those final "episodes." Known as Death & Rebirth and The End of Evangelion, they hold the promise of some type of resolution, and I think I may just go and hunt them down tonight.